The collection consists of four parts: (1) photocopied and original newsletters, pamphlets, publications, clippings and printed material in general; (2) manuscript collections and personal papers (most copied from original material held elsewhere); (3) microfilms; and, (4) photographs. 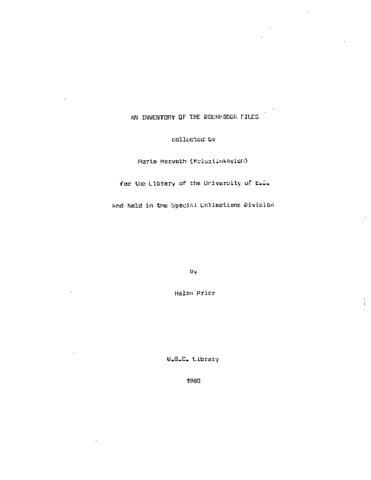 The manuscript files include the papers or records of Koozma John Tarasoff, Union of Doukhobors of Canada, Consultative Committee on Doukhobors, Stefan Sorokin, W.A. Makaseyoff, Peter V. Verigin, John G. Bondoreff, Christian Community and Brotherhood of Reformed Doukhobors, Peter Maloff, Alex Popoff, Eli Popoff, James Mavor, David Henderson, Claude Fisher, Peter Brock and Ivan Swetlishnoff. All the material relates to the history and activities of Doukhobors throughout the world as well as in British Columbia and Saskatchewan.